Craig Countryman is a Principal in the Southern California office of Fish & Richardson. 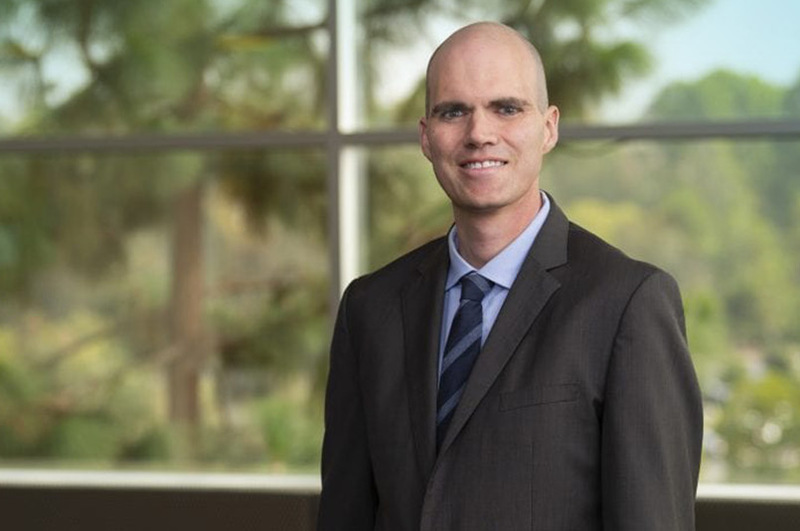 Craig has been named a Law360 MVP for Appellate work, a Rising Star by Law360, and he has been selected for the “Top 40 Under 40” lists in the Daily Journal, San Diego Daily Transcript, and San Diego Metro Magazine. His practice centers on complex legal analysis and writing, particularly case-dispositive summary judgment, JMOL, and Federal Circuit briefs. He also has extensive case-management experience in patent cases involving a range of technologies, including glaucoma drugs, polymer processing additives, spinal implants, coronary guidewires, power supply controller chips, network security, and computer backup software. Craig has led the briefing in over 50 Federal Circuit and Supreme Court appeals, including the Halo Electronics case, where Craig and his colleagues convinced the Supreme Court to revise the standard for enhanced damages in patent cases. He has extensive experience in taking over cases after trial, selecting the best legal issues for appeal, and framing them in a persuasive manner. Craig writes frequently on a variety of patent law topics and has published over 25 articles and dozens of posts of Fish’s litigation blog. Before joining Fish, Craig was a chemist and developed a novel synthesis of the anti-inflammatory drug ketorolac using a stereoselective, organocatalytic cycloaddition reaction as the main step. Los Angeles County Bar Association Bankruptcy Student of the Year (2006). Arie J. Haagen-Smit Memorial Award (2003). 2015 Patent Decisions of the Federal Circuit, 65 Am. U. L. Rev. 769 (2016). “Lessons from Fed. Circ.’s 1st Wave of Post-Grant Appeals” Law360 (December 16, 2015). “What Can You Do to Maximize Your Chances of Winning an IPR Appeal?” Fish Litigation Blog (June 4, 2015). “How Patent Reform Could Affect Claim Construction in IPR” IP Law 360 (May 20, 2015) with Michael Rosen. “Patent damages adrift from law,” Daily Journal (April 20, 2015). “Patent Eligibility of Nature-Based Products: Current View of the United States Patent & Trademark Office,” Industrial Biotechnology, Vol. 11, No. 2 (Feb. 2015), with Cong Yao & J. Peter Fasse. “Federal Circuit Report: Damages Award Vacated by Federal Circuit,” IP Litigator, Vol. 21 No. 1 pp.24-25 (Jan./Feb. 2015) (available here). “Laches in patent disputes in doubt,” Daily Journal (January 14, 2015). “It’s not always obvious what’s ‘obvious,’” Daily Journal (August 27, 2014), with Juanita Brooks. “Pay Up, Patent Case Loser,” The Recorder (May 8, 2014), with Alex Gelberg. “Properly pleading inventorship disputes in federal court,” Daily Journal (April 9, 2014) with Kevin Kantharia. “Federal Circuit Report,” IP Litigator, January/February 2014, Vol. 20. No. 1. “Federal Circuit confines the infringement analysis in generic drug cases to the product as described in the defendant’s FDA application,” Fish Litigation Blog (November 4, 2013). This article was also featured in theIP Litigator November/December edition. “Williams: A strange end to what Crawford began,” Los Angeles Daily Journal (June 28, 2012). “To Which Defendants Does the Fair Sentencing Act of 2010 Apply?,” Federal Bar Association, San Diego Chapter Newsletter, p. 1, 7 (Winter 2011). “Criminal Trial Advocacy Seminar Showcases Local Practitioners and Judges,” Federal Bar Association, San Diego Chapter Newsletter, p. 3, 12-13 (Summer 2011). “Misleading PTO Doesn’t Invalidate Patent,” The Recorder (July 21, 2011). “U.S. Supreme Court Confuses Patent Infringement Law” Los Angeles Daily Journal (July 6, 2011). “Judge Battaglia Discusses His Practices and Procedures,” Federal Bar Association, San Diego Chapter Newsletter, p. 6-7 (Spring 2011). “Intent to Induce: Accomplice Liability in Patent Cases,” Los Angeles Daily Journal (Oct. 25, 2010). “Ongoing Patent Royalties: How Should They Be Calculated?,” Los Angeles Daily Journal (Sept. 2, 2010). “The Rise and Fall of False Marking Claims,” Association of Business Trial Lawyers San Diego Report, Vol. XVII, No. 3 (Fall 2010). “The Supreme Court’s Decision in Bilski v. Kappos Leaves Many Open Questions About What Constitutes Patentable Subject Matter,” Federal Bar Association, San Diego Chapter Newsletter, p. 9-10, 18 (Summer 2010). “U.S. Supreme Court Holds Class Arbitration Cannot Be Compelled by an Arbitration Clause Silent on the Issue,” Association of Business Trial Lawyers San Diego Report, Vol. XVII, No. 2, p. 16 (Summer 2010). “Disclosure of “Material” Information in Patent Applications,” Los Angeles Daily Journal, Perspective (June 9, 2010). “An Analysis of the Justice Department’s New Position Regarding “Reverse Payment” Settlements,” The AIPLA Antitrust News p. 2-6 (October 2009). “Navigating The Marking And False Marking Statutes,” Law360 (June 17, 2009). “The Letter of the Law,” Los Angeles Daily Journal, “Focus Column,” 7 (May 28, 2009). “The Evolving IP Marketplace: The Third in a Series of FTC Hearings,” AIPLA Antitrust News, 2-7 (May 2009). “A Weapon of Mass Protection,”Los Angeles Daily Journal, “Focus Column,” 7 (February 13, 2009). “The U.S. Supreme Court Takes on Patent Law,” Association of Business Trial Lawyers San Diego Report, Vol. XIV, No. 3, p. 1 (Summer 2007). “At the Crossroads of Law & Technology: Fourth Annual Conference, Patenting the Human Genome,” Loy. L.A. Ent. L. Rev., 24, 111 (2004). “The Priest-Klein Selection Hypothesis in Constitutional Litigation” (in progress). Quoted, “Bill To End Chevron Deference May Put Target on USPTO Rules,” Law 360 (Jan. 20, 2017). Quoted, “Amendments Case Could Help Patents Survive AIA Review” Law360 (August 17, 2016). Quoted, “Fed. Circ.’s Embrace of PTAB to Fuel More AIA Reviews” Law360 (March 8, 2016). Quoted, “Patent eligibility update brings slight improvements for biotech” The Daily Transcript (April 27, 2015). “After RPX: Privity, RPII and Estoppel in AIA-Post Grant Proceedings,” Intellectual Property Owners IP Chat Channel (August 23, 2018). “Supreme Court Update and Cases to Watch,” panelist, Daily Journal Patent Disputes Forum – South, Beverly Hills, CA (December 6, 2017). “Enhanced Damages and Willfulness after Halo: What are District Courts Doing and How Can Parties Prepare?” speaker, NJIPLA Patent Litigation Seminar, Iselin, New Jersey (March 16, 2017). “Supreme Court Update & Cases to Watch,” panelist, Patent Disputes Forum South, Costa Mesa, CA. (October 19, 2016). “Enhanced Damages Law After Halo Electronics, Inc. v. Pulse Electronics, Inc.,” Supreme Court IP Review, Chicago-Kent College of Law (September 22, 2016). “Conflicts and Other Pitfalls,” moderator, Federal Circuit Bar Association Bench and Bar Conference (June 25, 2016). Biotech & Pharmaceutical Patents: 2014 Year in Review, presenter with Ahmed Davis, Fish Litigation Webinar (February 26, 2015). Biotech & Pharmaceutical Patents: 2014 Year in Review, presenter with Chad Shear (January 23, 2015). “Top 10 Issues from the PTAB Currently on Appeal,” presenter with John Dragesth, Fish Post-Grant Webinar (December 10, 2014). Halo Electronics Inc. v. Pulse Electronics, Inc.. – Counsel for Halo Electronics, a family-run business, in a long-running patent case related to packaging for surface mount magnetic components used in electronics products. In November 2012, a jury found defendant Pulse Electronics liable for willful infringement on three Halo patents, confirmed the patents’ validity, and awarded past damages. At that time, five other competitors had licensed the Halo patent portfolio. The Federal Circuit since affirmed the jury verdict of liability but set aside the willful finding, reported at 769 F.3d 1371 (Fed. Cir. 2014). Halo subsequently convinced the Supreme Court to vacate the Federal Circuit’s treatment of willfulness and set a new standard for enhanced damages in patent cases, reported at __ S. Ct. __ (2016). In re Power Integrations, Inc. – Obtained reversal of Patent Office rejection in an ex parte reexamination of Power Integrations’ patent to a novel circuit used to reduce electromagnetic interference generated by controller chips that are incorporated into power supplies. The Federal Circuit entered judgment confirming the patentability of the claims. Reported at 884 F.3d 1370 (Fed. Cir. 2018). Gilead Sciences, Inc. v. Merck & Co, Inc. – Obtained affirmance of an unclean hands judgment that set aside a $200 million verdict against our client, Gilead, along with affirmance of a fee award against the adverse party. The Federal Circuit sustained the district court’s findings that the patent owner was guilty of unclean hands where it allowed the prosecutor to access confidential information about the accused product’s structure, and then presented perjured testimony in the litigation to cover up that misconduct. Reported at 888 F.3d 1231 (Fed. Cir. 2018). Advice Interactive Group, LLC v. Web.com Group, Inc. – Obtained affirmance by the Eleventh Circuit of a preliminary injunction against the defendant’s trade secret misappropriation. BP Corporation North America Inc. v. Invista S.A.R.L. – Obtained affirmance of a Patent Office invalidity decision in an inter partes The patent covered a polymer manufacturing process. The Federal Circuit summarily affirmed the Patent Office’s finding that the prior art rendered the claims obvious and rejected the patent owner’s due process challenges. Reported at 721 Fed. Appx. 994 (Fed. Cir. 2018). Smartflash LLC v. Samsung Electronics America, Inc. – Obtained affirmance of multiple Patent Office decisions in covered business method reviews. The patents related to validation methods for online payments. The Federal Circuit summarily affirmed that the patents met the statutory definition of a “covered business method patent” and were invalid under section 101. Reported at 718 Fed. Appx. 985 (Fed. Cir. 2018). Queen’s University at Kingston v. Samsung Electronics Co., Ltd. – Obtained affirmance of final inter partes review decisions invalidating the Queen’s University patents as anticipated. The patents covered methods for controlling computers using eye tracking. The main issues on appeal involved due process and whether the prior art was enabling. The Federal Circuit summarily affirmed on all issues. Reported at 708 Fed. Appx. 680 (Fed. Cir. 2018). Topgolf International, Inc. v. Agarwal – Obtained Patent Office decision invalidating a patent to certain golf target greens used on a driving range. The Patent Office found the claims obvious in an inter partes The PTO decision is currently on appeal, and, if affirmed, will lead to dismissal of the co-pending infringement litigation against our client, Topgolf. IXI IP, LLC v. Samsung Electronics Co. Ltd. – Obtained affirmance of Patent Office decision invalidating claims to a system for providing Internet access using Bluetooth and JINI technology. The main issue on appeal was whether a prior art reference implicitly disclosed one of the claim limitations. The Federal Circuit rejected the patent owner’s technical arguments and affirmed the Patent Office’s factual findings. Reported at __ F.3d __ (Fed. Cir. Sept. 10, 2018). Power Integrations, Inc. v. Lee — Obtained vacatur of the Patent Office’s rejection in an ex parte reexamination of Power Integrations’ patent to a novel circuit used to reduce electromagnetic interference generated by controller chips that are incorporated into power supplies. Reported at 797 F.3d 1318 (Fed. Cir. 2015). Allergan v. Sandoz et al. – Counsel for Allergan in a Hatch-Waxman case involving the sight-saving glaucoma drug LUMIGAN® .01%. Obtained a favorable claim construction, and, after a five-day bench trial, obtained a finding that the patents were infringed and valid. Led the Federal Circuit briefing and obtained an affirmance on all issues, reported at 796 F.3d 1293 (Fed. Cir. 2015). Medtronic, Inv. v. NuVasive, Inc. (Fed. Cir.) — Counsel for NuVasve in a Federal Circuit appeal from an inter partes review in which the PTO confirmed the patentability of NuVasive’s claims to a method of lateral, trans-psoas spinal surgery using a variety of surgical tools. Obtained summary affirmance of the PTO’s decision under Federal Circuit Rule 36. Warsaw Orthopedic, Inc. v. NuVasive, Inc. (Fed. Cir.) — Counsel for NuVasive in a Federal Circuit appeal in a patent infringement case involving spinal implant, retractors, and nerve-monitoring systems. Obtained vacatur of a $101 million judgment and ongoing royalty against NuVasive, because the Federal Circuit determined that Warsaw was not entitled to lost profits, which were the bulk of the damages award. Also obtained affirmance of an infringement judgment against Medtronic (Warsaw’s sister company) on a NuVasive patent. Reported at 778 F.3d 1365 (Fed. Cir. 2015). St. Jude Medical v. Volcano Corp. (Fed. Cir.) – Counsel for Volcano in a Federal Circuit appeal from the Patent Office’s denial of St. Jude’s petition for inter partes review. The Federal Circuit granted Volcano’s motion to dismiss for lack of jurisdiction, reported at 749 F.3d 1373 (Fed. Cir. 2014). Prometheus Laboratories v. Mayo Collaborative Services, et al (S.D.Cal.) – District court and appellate counsel for defendants in patent infringement action over metabolite assays for thiopurine drugs. Obtained summary judgment of invalidity under 35 U.S.C. § 101. After reversal at Federal Circuit Court of Appeals, Supreme Court of the United States reversed appellate court at 56 U.S. 101 (2012). IPLearn-Focus LLC v. Microsoft Corp. (Fed. Cir.) – Obtained summary affirmance of a district court’s decision invalidating under 35 U.S.C. § 101 three patents that were directed to the abstract idea of using computers to observe, analyze, and react to human behavior. The Medicines Co. v. Hospira, Inc. (Fed. Cir.) – Submitted amicus curiae brief for Gilead Sciences, Inc. related to the Federal Circuit’s en banc consideration of several issues related to the on-sale bar. The Federal Circuit unanimously agreed with the result urged by Gilead, finding that the transactions at issue were not subject to the on-sale bar, and it twice cited Gilead’s brief in the opinion. SRI International, Inc. v. Symantec, Inc. (Fed. Cir.) – Obtained summary affirmance of a district court’s judgment finding that SRI’s network security patents were infringed by Symantec and not invalid under §§ 102 and 103. See 401 F. App’x 530 (Fed. Cir. 2010). 3M/Dyneon v. DuPont Performance Elastomers (D. Minn.) — Represented 3M and Dyneon in patent litigation asserting their patents covering use of multimodal fluoropolymers as polymer processing additives. Case favorably settled shortly before trial. Netcraft v. AT&T Mobility et al. (D. Del.) – Represented Netcraft in a patent infringement suit against several mobile device carriers in a case involving billing methods for ringtones and other “off portal” content. Obtained favorable rulings on claim construction and motions in limine. Case settled favorably shortly before trial. Lucent Technologies v. Microsoft Corp. – Obtained judgment as a matter of law for Microsoft reducing its damages liability by a factor of 10 from what was originally awarded by the jury. Opinion published at 837 F. Supp. 2d 1107 (S.D. Cal. 2011). Callaway Golf v. TaylorMade (S.D. Cal. ; E.D. Tex.) – Represented Callaway Golf in litigation against TaylorMade involving a number of patents related to irons, high moment of inertia drivers, and golf balls. Cases settled favorably shortly after filing. SkyHawke Technologies LLC v. Callaway Golf (S.D. Fla.) – Defended Callaway Golf in litigation involving a patent to mobile GPS devices for displaying course information to a golfer based on his location. Case settled favorably shortly before trial. In re Maithya (Board of Immigration Appeals) – Obtained affirmance of a decision granting withholding of removal based on evidence that Mr. Maithya would face a substantial risk of persecution on account of his sexual orientation if he were returned to Kenya. Wright v. Director of Corrections (S.D. Cal.) – Obtained denial of summary judgment of Mr. Wright’s First Amendment claim against prison officials for transferring him into administrative segregation in retaliation for reporting an assault by prison guards. Case settled favorably shortly before trial. Alford, et. al. vs. County of San Diego (CA state court)– Representied a plaintiff class of indigent residents of San Diego being denied subsistence health care in violation of Welfare and Institutions Code Section 17000. The class was victorious in the California Court of Appeal, see 151 Cal. App. 4th 16 (2007). The class also prevailed in several challenges on remand to the County’s incoming eligibility limits for the program and its procedures for reviewing applications. Schmidt vs. Executive Office of Immigration Review — Successfully convinced EOIR to rescind its termination of an immigration court translator where the agency had terminated him based solely on his membership in a political organization and speech regarding political issues, averting the need to seek injunctive relief in Federal Court.